Professional installation results. From large jobs to little jobs. All sorts of wall problems solved fast. Neat and very experienced work crew. Get your free estimate. Very easy to work with. You will like the way it turns out. Got some type of renovating project going on? Maybe you just want some repairs to your wall or ceiling. Talk with a business that performs putting in and fixing walls and ceilings. If you have an area that needs fixing, they are able to help out. Many of their work requests are for repairs. And they also work on new construction too. Some assignments, such as exchanging moisture damaged sheetrock, are pretty extensive; other assignments may involve solely patching a hole or two. They work inside a variety of buildings. They may be individual houses, apartments or business properties. 1. The drywall is brought to the work site. 2. The sheets are affixed to the ceiling and walls. 3. The trash and extra material is gotten rid of, and the area is cleaned. 4. The joint seams and screws are taped and concealed with joint compound. 5. The surfaces are sanded, finished and textured. As soon as your new surface areas are textured and dry, you could start painting. Most homeowners have the contractors carry out the entire job, from beginning to end, but some have them just complete a couple of those steps. For instance, some folks will have them just do the delivery and installation of the sheetrock. They will have someone else carry out the sanding and texturing tasks at a later date. Sometimes they get called out to projects where the sheetrock is already up on the walls, they just have to do the taping and mudding and sanding and finishing parts of the job. Besides typical sheetrock, they can also install moisture resistant boards to use in bathrooms or around sinks. Plus they use the right variety of cement board for walls where you want to have heavy tile. 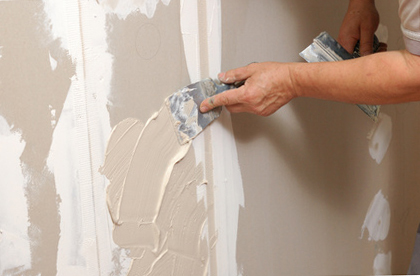 Plumbing problems and human accidents are the major factors behind sheetrock damage. Holes, bruises and water damage happens. If the trouble with your property is simply a single hole or dent, it’s possible you can repair it on your own by using a wall patch kit. Putting on a wall patch is not as easy as it looks on the box. Most homeowners can’t get it smoothed in right and the final surface doesn’t match. While we encourage property owners to not hesitate to try little wall repair projects, we usually feel that bigger repairs, especially in the primary rooms of a home, be taken care of by a pro. During the final days of a repair, they pay attention to the surface of the repaired or new finishes to make certain they match up with the surfaces of the old walls or ceilings in the remainder of the room or home. Fixing one or two separate holes or dents. Correcting a few bad panels so an area or rooms can be repainted. Getting rid of and replacing sheets of sheetrock spoiled by water. Completing the elimination and replacement of a big area or room. Generally because of a water problem or other serious event. 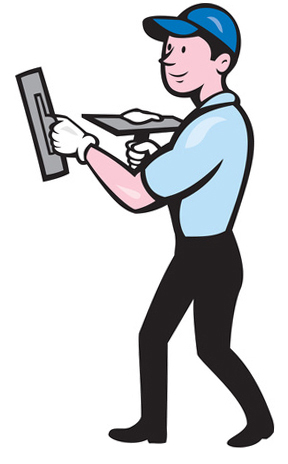 Regardless of what type of repairs you have in mind, they can help you out. You may have one or two options concerning the final finish we make on your walls or ceiling. Entirely unfinished – just taped, for unfinished work areas or garages. Simple texture – provides a little extra dimension. Complex texture – hand-troweled and is more challenging to do. Texture matching – your replacement surfaces match with your old ones. Are your ceilings sprayed with that popcorn ceiling texture? Your specialist will scrape off that outdated, messy ceiling texture and put on a clean and smooth one. They’re a local home improvement drywall company. They attempt to keep prices reasonable while providing results their clients like. They bring along the best tools and gear to the job to get your project done quick and done correctly. And they use only the top materials for your project, so they will withstand damage and last a long time. Home maintenance will create a mess. They are always respectful of your property. They try to keep the airborne dirt and dust to a minimum. They strive to leave no clutter for the property owner. They clear away all the leftover material and garbage when they’re done. Most of the work is completed in single-family residences, but they also work in industrial and multi-family projects also. They understand you have choices. You just have to make the choice to call. Each project is different. But they can try to calculate a quote for you. Your cost will be based mostly on the size of the project and how much of the job you want them to do for you. While they can’t often stop by a prospective job site and present an estimate in person, they will frequently present a decent quote should you make a quick call. If you would rather have them handle the painting phase of the process, they will begin with that as soon as the ceiling or walls are dry and ready for paint. Painting is something that a lot of property owners like to do on their own, so just let them know what you would want to do. Are They Working in Your CA Neighborhood? They work in quite a few of the sections in the central district of downtown Fresno and the 93701, 93702 or 93721 zip codes. They can also head out to most of the suburbs as well – Clovis, Edison, Herndon, McLane, Madera, Roosevelt, Tower District, West Fresno, Woodward Park and the Fresno State Area. If you’re near the center, or in downtown Fresno, or close to the 93701, 93702 or 93721 zips – let them know how they can help.